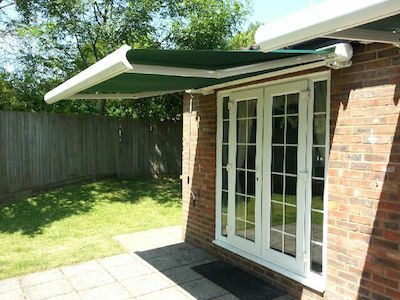 Sun awnings add shade and comfort to your garden and patio area. They are available in a wide range of fabric designs and operation types to suit all applications. Integration into home automation is easily achieved, allowing your sun awning to be controlled from a single hand held control. All of the Aluminium profiles used in the manufacture of the Premier-Shade products are designed and tested to TUV standards to withstand wind loadings of up to 75 mph. All profiles are fully finished in polyester powder coated white and brown, with the option of a colour of your choice. The Premier-Shade fabric range is extensive, giving the choice of single colour or striped fabrics. All of the fabrics used are of the highest quality with fully dyed thread throughout, eliminating premature fading. They are specifically managed and are coloured throughout the depth of the fabric, not just the outer thread faces. All carry a 5 year guarantee against solar fading and deformation.